Pres. 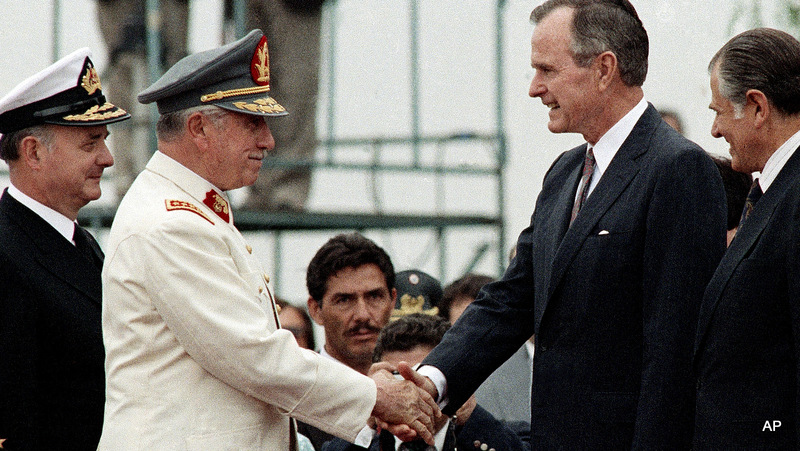 George H. W. Bush, center, shakes hands with former Chilean dictator Gen. Augusto Pinochet, Dec. 6, 1990, Santiago, Chile. From the Archive: Forty years ago, a car-bomb exploded in Washington killing Chile’s ex-Foreign Minister Orlando Letelier, an act of state terrorism that the CIA and its director George H.W. Bush tried to cover up, Robert Parry reported in 2000.
n early fall of 1976, after a Chilean government assassin had killed a Chilean dissident and an American woman with a car bomb in Washington, D.C., George H.W. Bush’s CIA leaked a false report clearing Chile’s military dictatorship and pointing the FBI in the wrong direction. Sept. 21, 1976. Firemen remove victims from a car shattered by a bomb blast on Embassy Row in Washington. Orlando Letelier, former Chilean ambassador to the U.S., and Ronne Karpen Moffitt, his aide, were both killed in the blast. Michael Townley, shown in Santiago de Chile, April 8, 1978, Townley was the Assassin tasked with the murder of of Chilean ex-Foreign Minister Orlando Letelier. Orlando Letelier, a former Chilean ambassador to the U.S., is pictured in April 1975, one year before being assassinated with the complicity of the CIA. Investigative reporter Robert Parry broke many of the Iran-Contra stories for The Associated Press and Newsweek in the 1980s. You can buy his latest book, America’s Stolen Narrative, either in print here or as an e-book (from Amazon and barnesandnoble.com). This article was originally published Consortiumnews.